Pakistan Rangers Sindh on Wednesday morning raided at Muttahida Qaumi Movement (MQM) Headquarter Nine-Zero in Karachi. During the raid, all surrounding area cordoned off by Rangers and searched through departments of the party’s offices. Rangers arrested several MQM activists, target killers and MQM MPA Amir Khan. According to details, Rangers personnel conducted a two-hour long search operation and also cut off telephone lines of Nine-Zero. During raid many MQM activist gathered in front of Nine-Zero soon after the search operation commenced. Slogans were chanted against the law enforcement agencies. Rangers fired aerial gun shots to disperse protesters. 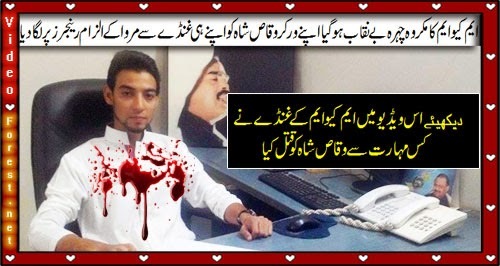 A MQM party worker Waqas Shah was shoot dead eventually in protest. MQM claimed that it was killed by a Ranger soldier but Rangers fully denied MQM claim. A Pakistani private news channel exposed Waqas Shah murder reality and broadcast a video in which a MQM gunman can seen who was the real killer of Waqas Shah. Click on video to play.